Video is the language of our time and Voss & Associates can provide premium content at a speed and cost that keeps pace with your demands. We provide complete video and audio production services, from script to screen, generating premium content for your website, internal communications, social media, training, presentations and more. We are prepared to shoot everything from interviews to classroom lessons to musical performances to narrative content with plot, characters, and costumes. We are also equipped to produce expert motion graphics and animation. The bottom line: We will tell your story in a most compelling way. A carefully crafted short video can bring your story to life. Harnessing the power of digital technology and inspired storytelling, we can spread the word about all the amazing work you’re doing in your classroom, at your district, or in your company. The Voss & Associates team is proud to announce a new suite of video production services customized to your needs and budget. You can now join a major mega-trend by telling your story through short videos and distributing them through a vast array of free channels. 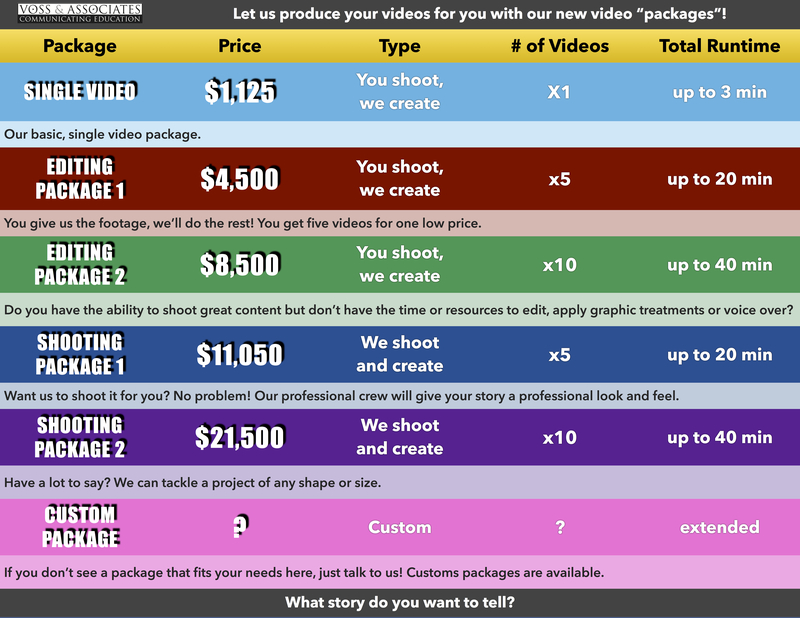 We’ve made it easy and affordable by offering a “you shoot, we assemble” package, as well as full-scale “script to screen” productions and animation. We can write the story, edit your video and apply music, graphics and voice over for a professional look. We can also provide sound and video crews. With prices starting at $1,125, now you can tell your story. Contact David Voss for more details! Download a PDF of our Video Production Flyer here. Voss & Associates has been communicating education since 1999, representing school districts, education associations, non-profit organizations and for-profit companies offering services and products to educators. Copyright © 2016 | Voss & Associates | Communicating Education | All Rights Reserved.